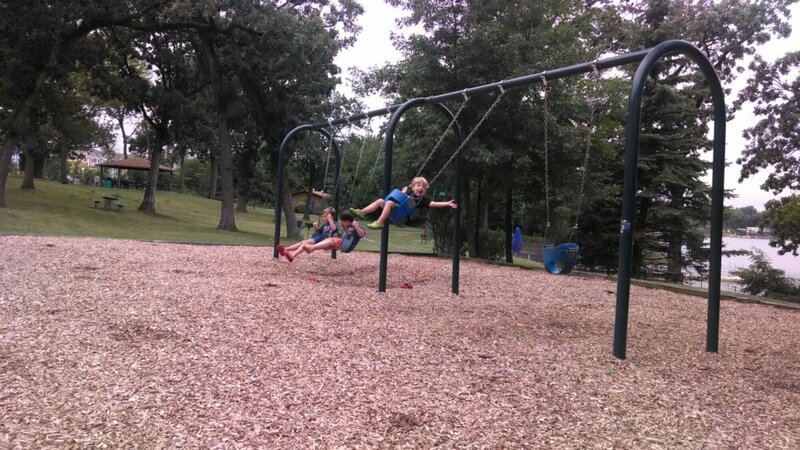 This past weekend, the boys all agreed that swinging at the park was the most fun of all. This weekend we had some good times. We had a few rough times, too…but there were definitely some moments that I want to hold onto for just *a little* while longer. -Like when Tate caught my eye on Saturday morning when I came downstairs to get the coffee going. His arms were outstretched, his smile wide, and his eyes glistening. “MOM-EEE!” Oh, I want to hold onto that. -Or when Cole crawled into my lap when he came downstairs that day. He snuggled into my chest and twisted my hair between his fingers. He let me breathe him in…I inhaled every bit of his little boy sweetness that I could. I know our time like this is fleeting. Sooner than I would like, my baby is going to be too big, too heavy, too cool, to sit on my lap like that. -The 3 boys helped Hubz with yard work yesterday while I was at the store. Like actually pulled weeds and picked up trimmings, and the like. I love that they are able to spend time with Hubz…and that he can teach them some very practical home-keeping tips in the process. -I took the boys for a walk around the block last night. Well, they rode bikes while I was forced to run pathetically after them. Tate shrieked with delight as he felt the wind blast him in the face, rush through his hair, and felt the vibration of the ground beneath him. That joy. That unbridled joy. I love that something so simple makes him so very happy. -Jake used the word, “wiener” to refer to his, um, yeah….. I was amused, but had to pretend to be appalled. (I always worry about him being immature and unable to relate to peers. That right there shows me he “gets” a lot of the convo that is going on…much to my delight and chagrin. I asked him to try to not use that one in front of his brothers…I really don’t need Tate scripting that. It will happen in its own time, and I don’t need him to expedite that. -The three boys sat in the family room and watched SpongeBob together last night. As they watched it, they actually TALKED ABOUT THE SHOW together. Even Tate. And then they simultaneously burst into laughter because there was a potty joke. They shared their gummy bears, gummy worms, and sour patch watermelon candy together…and it was nice to see something just so….typical. So, lots of little moments. Moments that, together, add up to some great memories…and help me get past the not-so-awesome moments like bickering, social difficulties, frustrations, attention issues, and so forth. Editor’s note: I meant to publish this sooner, but an unfortunate tummy bug took control of my life for a few days….enjoy. Shortly after Tate was born, there was a commercial for ESPN with the Manning brothers. All five of the Mannings were touring the offices. Archie and Olivia Manning are in the lead, very interested in the tour. Cooper Manning, the eldest, is right behind his parents. Lagging behind, Peyton and Eli are kicking and jabbing at each other…like brothers tend to do. Hubz and I watched the commercial, amused, and joked about how that would be our boys some day. Of course, that is before the delays were painfully apparent. Before autism and ADHD diagnoses. And before we realized how different our family dynamic would be. It’s not wrong or bad…just different. Admittedly, after we found out about Tate’s autism, I mourned that he and his brothers would not have a “typical” sibling relationship–complete with rivalry, bickering, and secret moments that only they would “get”. I was stuck on that whole “social isolation” component of autism. It made my heart ache. Luckily, our boys have always had a pretty good relationship. Different, yes, but they have always had some connection. As Tate has made gains over the past two years, the bonds have only strengthened. So, while our boys do have a slightly a-typical relationship with each other, there is so much typical in there that it makes me smile. For instance,Tate and Jake giggle and chat in their room each morning before they emerge. They have inside jokes. They share glances and giggle. Yes. I said it. They share glances!! Tate is a stereotypical middle child. He loves to instigate, prod, and tease. He also tends to feel, quite strongly, when one of his brothers is sad or hurt. He is usually the first to ask about their issue/problem, and is often quick to offer a tap on the shoulder. This tap is a huge thing for Tate…and it’s his way of connecting. Last Saturday Tate had a soccer game. It was his first one of the spring season. As we walked back to the car afterwards, Jake put his arm around Tate’s shoulder. They were sharing a moment..and then it became a headlock, with Tate shrieking with laughter. He kicked his leg at Jake, playfully. Jake playfully shoved him aside. Hubz and I looked at each other…and knew, just knew….it was going to be all right.